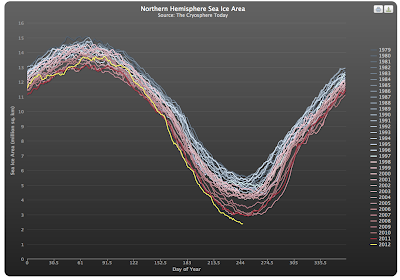 The loss of arctic sea ice is nothing short of astounding. Somebody's going to have to come up with a new spot for Santa's Workshop, or a bunch of kids are going to be very disappointed to learn that Santa's drowning in an open ocean. Shortly after the initial version of the human genome sequence was published, I had a lengthy horseback chat with a man who did due diligence for a VC firm that invested in biomedical tech. Two of his thoughts have stuck with me: (1) "We're at least 25 years away from having a reasonably full picture of how the protein chemistry in mammals actually works," and (2) "There will be multiple Nobel-winning breakthroughs on the path to building that picture." It's an enormously difficult problem. Okay, I usually turn to Sharon Astyk's blog to help me laugh about deadly serious things, but ohioclimate, that was funny. Yeah - I hope Santa has got the elves started on building an Ark, because I don't think they have a whole lot of time left. Since you are a physicist, you may have seen the article in Physics Today, entitled "The thinning of Artic sea ice", by Kwok and Unstersteiner. April 2011. It states that the heating is much more rapid than can be explained by carbon dioxide warming, and that the reasons for the heating are still a mystery. From its conclusion: "As stated above, the net heat required to account for the average loss of ice during the past three decades is of similar magnitude to a 1-W/m2 global heat surplus.14 Assuming that the surplus continues, and assuming that the global system does not undergo fundamental shifts, the share of heat received by the Arctic can be attributed to a host of variables and processes, including the cloudiness of Arctic skies; the distribution in the types of clouds; the temperature at the base of those clouds; changes in ocean-surface albedo; variations in the meridional transport of heat by the atmosphere, ice, and ocean; and the effect of greenhouse gases on all those factors. Gaps in our understanding of the processes that affect each factor represent a significant challenge to researchers attempting to assign specific causes for the thinning and loss of MYI or to project more detail than a general trend toward less Arctic ice in the future." Don't forget Superman's Fortress of Solitude, which is in the Arctic. Changing the subject and tone a bit, there's a new paper by the economist Robert Gordon, called "Is U.S. Economic Growth Over? Faltering Innovation Confronts the Six Headwinds". The paper reviews the long-run history of economic growth. It shows that the big gains to households have already been made and goes on to suggest that U.S. growth (and by extension other OECD growth) will likely be subdued for the next 30 years or so. The paper is a bit slipshod,* but if it is even half right about the near future, the economy will become more of a zero-sum game. Risks from social disunity are increasing. That's not exactly what we need, given the other challenges we are facing. * The paper may have flaws, but the criticism of it that I have seen so far is worse. Critics focus on irrelevancies, confuse invention with innovation, ignore the roles of incentives, household income, and demand, and reach for magic ponies such as at-will genetic engineering and mass behavioral modification.